The Marine Corps kept me away from home a lot during my nearly 24 year career as a Fighter Pilot with three overseas tours over one year duration each without my family. Additionally, there were countless periods of TAD away from home at hot spots and on carriers for stints of 2 to 4 weeks which kept me from enjoying many wonderful events in the children's lives. So, when I was living with them we used all my free time to experience every enjoyable and exciting activity possible. The boys had started flying when Mike was age 10 and Chris was 8 years old. The boys were the first two students of a young lady with a new CFI. We rented Cessna 172 and 182 aircraft for family flying. Mike soloed at 16 and had his commercial license at age 18. Our frequent flying trips helped Mike build up flight time and gain experience for his CFI. This is the story of a three day flying cross country fishing trip to the Grand Canyon, Las Vegas and on to Bullhead City where I, and my two sons, Mike and Chris, met Annie Oakley and her retired sea Captain companion. Not a hook, line or sinker got wet from 12-14 April 1976. The trip had been planned for weeks in anticipation that the weather would be typically clear and visibility unlimited for the three days. Weather was clear when we left Orange County Airport but a storm was crossing Nevada heading for Arizona and the Grand Canyon. When we approached GCN, the overcast was about 10 thousand and a light rain was falling. The turbulence indicated gusty winds. We called the tower and reported that we would make a 500 foot high pass over the airport on runway heading and out over the Grand Canyon and then turn downwind for landing. The pass down the runway was bumpy but we anticipated no problems over the Canyon. While we approached the edge of the Canyon we were talking about how it was almost straight down to the Colorado River. We passed over the edge of the Canyon and we instantly felt a terrific surge upward, a loud roar and loose gear was flying in the cabin. The aircraft rose rapidly for less than a minute and then the 86 quart ice box went to the ceiling and Chris lost his breakfast banana as the plane suddenly stopped climbing. I took the aircraft from Mike and turned downwind. We landed without further incident. After deplaning we started looking for damage to the airframe. Not a wrinkle or a popped rivet was found. I guessed the G force must have been an instantaneous 6-7 G's but no damage. Cessna makes hardy, trustworthy airplanes! The three of us decided we wanted a warm room in Las Vegas rather than camping in rain and cold on the plateau at GCN. After refueling and filing a flight plan Mike got us airborne and turned toward Las Vegas. Mike landed on the numbers when we arrived just before dark. We refueled and took a cab to a favorite hotel. We each ate a huge meal and skipped the night life of gambling and shows. We arose early the next morning and went to the hotel restaurant and ordered Hang Town Fries for breakfast. We loved the Gold Miner breakfast and ate it anywhere it was on the menu. Sometimes eating it three tines a day in Nevada. The Hang Town Fries breakfast consisted of bacon, fresh oysters and eggs. What a Meal!! It was back to the airport, preflight the Cessna and activate our flight plan. We were cleared by departure control direct to Bullhead City. Weather was overcast with light rain. Mike made his usual perfect takeoff and we enjoyed the scenery down to Bullhead City airport. Mike handled the stiff crosswind during landing without difficulty and he taxied to the parking area. We felt there would be a chance to fish from the bank of the river so took all of our fishing gear and our camping equipment across the highway and down to the motel. The ground was pure mud which meant no camping on the river. I got us a room and we stowed all our gear there except for fishing rods and bait. We walked through the willows down to the river bank but realized it was virtually impossible to fish. The banks were slick and dangerous so we walked down to the ferry ramp and watched the people come and go to the Gambling Casino anchored in the center of the Colorado. Something about the state line in the middle of the river made it legal to gamble on the steam boat. The woman looked a generation older than me. That would put her close to 60, I was guessing. She had comely facial features but the frown lines were permanently carved in her forehead. Her wide brimmed cowgirl hat was misshapen and damp like it had been serving as her umbrella. Her dark brown hair was long and straggled. She had an abundant chest and wore a wide. leather belt around her waist. She put her left hand into a slit below her waist belt and commenced reaching deep down into her long dress as though trying to find her money. I was attracted to her for the value of this experience for the two teenagers with me. I stood up and said, "Lady please finish your order and come sit and eat with us at our table. I'll pay for your dinner." She nodded an assent and scuffed her muddy boots over to our table. The water in the glasses looked a trifle dusty so I ordered a large pitcher of beer with four new glasses. I introduced the three of us to the lady and asked what her name was. 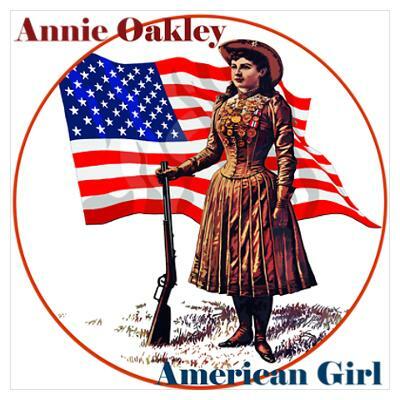 She said, "My name is Annie Oakley and I can shoot a hole clean through a whiskey bottle and never break the bottle." The table was oohing and awing as I filled each glass with beer. The boys were attentive to this stranger. "Miss Oakley, do you still shoot a gun?" I asked. "Yes." She answered. "You can call me Annie. Yes. I still shoot my Colt forty four. And, I can still shoot a hole clear through a whiskey bottle and never break it." I poured Annie another glass of beer. Mike and Chris had finished their Tacos, Enchiladas, Burritos and Salsa Tortillas and were sipping their beer and listening to this seemingly wise woman talk. Annie was saying, "I'm going to teach you lads a song. Are you ready to learn and sing it with me?" The boys nodded their heads saying, "Yes! Sure! We're ready to learn a song." Annie Oakley commenced to sing the song and we joined right in at the second line. What did Delaware, boys? What did Delaware? What did Ioway boys, what did Iowa? I ask you now as a personal friend, what did Ioway? She weighed a Washington boys, She weighed a Washington. I tell you now as a personal friend, She weighed a Washington. What did Idaho boys, what did Idaho? I ask you now as a personal friend, what did Idaho? She hoed her Maryland boys. She hoed her Maryland. I tell you now as a personal friend, She hoed her Maryland. What did Tennessee boys, what did Tennessee? I ask you now as a personal friend, what did Tennessee? She saw what Arkansas boys. She saw what Arkansas. I tell you now as a personal friend. She saw what Arkansas. Where has Oregon boys? She's gone to Oklahoma. What did Mississippi, boys? She sipped her Minnisota. How did Wesconsin, boys? She stole a Newbraskey. Why did Califoniya, boys? She called to say Hawaiiya. How did Floradie, boys? She died in Missouri. Suddenly, Annie leaped to her feet and shouted, "My Gawd! It's dark outside and I forgot about the Captain's dinner!" She ordered another Mexican platter and I ordered more beer. Annie told us about all the traveling and shooting contests she had won. She also told us about her Sea Captain and all the ships he had sailed across the oceans. Again, she jumped up saying, "My Gawd. The Captain's dinner is getting cold. We have to take it home to him right now!" "Annie is the Captain going to want to see us? If he's angry about his late dinner maybe we should stay here and you take his dinner to him." Annie quickly responded, "No! I want you to meet him and him to meet your youngsters!" So we all left the restaurant for Annie's place. Annie led us across the parking lot heading north into the muddy willow strewn river bank. A hundred or so yards into the willows, Annie shouted, "Here we are!" It was dark except for some light reflections on the river from the Casino. As I caught up with her standing in the rain and mud, I noticed she was leaning on the door of a car. A Ford Edsel! The car was sitting low in the mud no tires or wheels. It was permanently located like a trailer home. 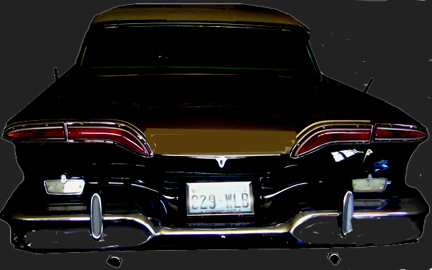 A man's crisp voice sliced out of the open windows of the Edsel. "Where have you been with my dinner? You left over four hours ago to bring me some food. Have you brought company instead?" The voice had the sound of a distinguished gentleman. Maybe a school teacher or professor. Yes, and maybe even like a Ship's Captain. Annie rattled the handle on the door while handing the take-out dinner package inside. "Hell! This food is cold!" the camper Captain was unhappy . Annie said, "I would invite you into the back seat, Ed, but our cat just gave birth to kittens night before last and they're in the basket on the seat." Chris spoke with some urgency, "I have to go to the toilet." Mike seconded the motion with a "Me too." Annie told them, "Go off to the right in the willows. The toilet is there." A long way from a ship's head. 'Nothing like camping in the wilderness all your life, or what's left of it.' I thought. The boys were embarrassed and uncomfortable talking to a man and woman living in a wrecked automobile on the banks of the Colorado River. We never could see the kittens or even the Captain's face. Home is a home? Or is it a trashed Edsel? Did they qualify as homeless? We bid Annie Oakley and her ship Captain "Good Night and Good Bye." I added, "Thanks for the songs, Annie. We won't forget you." And we haven't. We cleaned the mud from our shoes and entered the motel room. The boys spread their sleeping bags in two corners of the room and the single double bed was mine. Next morning the weather was clear. The trip back to Orange County Airport was uneventful. The boys were quiet throughout the trip and later in the car. But, as soon as their saintly Mother opened the door, the Bullhead City--Annie Oakley story poured forth faster than the Colorado River rolling to Mexico.